Easy Vegan Mushroom Gravy comes together quickly with only a few ingredients. It’s gluten-free and oil-free. Enjoy it on all your favorite comfort foods. I must admit, growing up I was never a fan of gravy. I never liked it growing up, which was fine since my mom never served it. In fact, I don’t recall her ever making mashed potatoes either. However, now that I’m in charge of Thanksgiving and holiday dinners, I always include gravy on the menu since most people really love it. And I do, too, now that I know how to make it vegan! But one thing I really love is mushrooms, so if I’m going to make gravy, it has to be this Easy Vegan Mushroom Gravy! I started incorporating them more frequently into my regular diet when I learned about Dr Fuhrman’s “G-BOMBS”. If something so delicious can help prevent cancer, I’m all in! And this gravy tastes delicious on holiday loaves and vegetables. I like using cremini mushrooms, but you can use white button mushrooms if you prefer when making Easy Vegan Mushroom Gravy. Since mushrooms have a high water content, you don’t need oil when sauteing them. Basically all you do to make this gravy is saute the mushrooms with garlic and seasoning, then add a slur made from tapioca flour and water. Alternatively you can use cornstarch or arrowroot powder. And since it’s healthy, you don’t have to feel guilty about adding a lot of gravy to your plate. Easy Vegan Mushroom Gravy really is easy to make. This is not a classic gravy where you make a roux. Rather it’s a short-cut gravy you can make very quickly. And you can make it ahead of time and reheat it the next day! I like to serve it as part of a Thanksgiving or Christmas dinner along side some of my favorites. These include mashed potatoes (of course), Lentil Meatloaf Muffins, White Wine Roasted Vegetables, and Fresh Cranberry Apple Relish. What are your favorite dishes to make with gravy? Please let me know in the comments! Now let’s make Easy Vegan Mushroom Gravy! This simple gravy comes together in minutes with minimal ingredients. It's delicious with Instant Pot Mashed Potatoes! 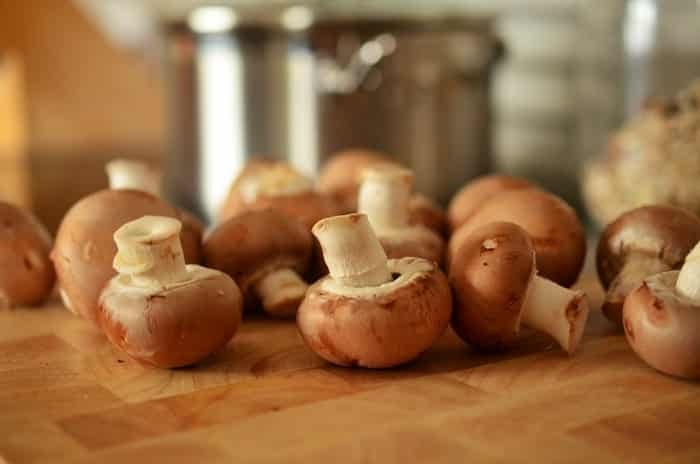 In a small pot, saute the mushrooms for several minutes, stirring frequently, until they are reduced in volume and all the excess water is evaporated. If your mushrooms stick, add a splash of water to the pan. Meanwhile, add the tapioca flour to the cup of water and stir well. Set aside. Add the garlic to the mushrooms and saute for 30 seconds. Add the thyme and salt and pepper, to taste. Give the tapioca flour/water mixture a stir and slowly add it to the mushrooms. Stir until the gravy has thickened. If you prefer a thinner gravy, add a little more water and stir. I’m usually not much of a gravy person but this sounds FAB! I used almond milk instead of water and added juice from the chicken I made. It was sooo good!! Sounds so good. I was racking my brain and Google to use my go to almond milk. Thank you for your reply to easy vegan website. Much needed. Any other suggestions where i can incorporate almond milk, I’m all EARS. Yummy! Used tapioca flour for the first time-out of fresh mushrooms, used well rinsed canned ones and omitted the added salt. Glad it turned out well, Dee! I made this last night and was so pleasantly surprised! I have made other vegan mushroom gravies but none that tasted as great as this one! My search for a keeper recipe has ended. I used the arrowroot powder as that was what I had on hand, and substituted vegetable broth for the water. So yummy! That’s wonderful, Deborah! Thank you so much! Thank you so much for sharing this wonderful recipe prepared it for my husband, for he’s the only vegetarian in the family. I’m so happy he enjoyed it, Sarah! Hi Jole, Yes, if you double the recipe you should also double the cornstarch if you are using cornstarch instead of tapioca flour. Great gravy! Made it as written and it was so good! Thank you! I blended it afterward in my nutrbullet and it was unbelievable! How would sauteing without oil work in a cast iron pan? That should work fine. If the pan appears too dry, you can add a little water. I made this gluten free mushroom gravy with a couple of adjustments. I sautéed chopped fresh white mushrooms with diced sweet onions in about 2 tablespoons of butter, added granulated garlic with parsley and a medley of no salt seasonings which includes tyme, rosemary, sage and more. I added a splash of Chardonnay and 1 cup of chicken broth. I used 1 tablespoon of cornstarch as the thickener. It turned out excellent!! Thank you for the recipe. So you made a completely different recipe that happens to have mushrooms in it?